January marks the beginning of the year: A chance to start afresh. A time to cast out old habits and routines, and to welcome the new you. An opportunity to actually keep those New Year resolutions! The most important -and certainly timeless- promise, arguably for every person on the planet, involves taking better care of oneself. In fact this is the one resolve we should all adhere to, especially in light of our contemporary, hectic, stressful lifestyles. And what better way of loving thyself in practice, than by going on a -much needed and deserved-holiday? Vast and varied; dotted with crisp white buildings and blue-domed churches; and surrounded by clear turquoise waters (think aquamarine in Technicolor!) Paros, right at the middle of the Aegean archipelago, is- no wonder- one of the most coveted destinations in the Mediterranean. In fact in recent years it rivals, Cyclades’ mega stars, Mykonos and Santorini, due to its postcard perfect scenery, amiable locals, fantastic food, abundant day activities and lively nightlife scene. Yet behind its cosmopolitan, buoyant character, there is a fascinating history that dates back several millenniums. The island has been inhabited since 4.000 B.C, while its trademark, white marble-from which iconic Venus de Milo was carved of-made it world famous even in antiquity. Boasting a captivating past and present, Paros is undoubtedly charming. In fact it has been luring writers and artists, seeking their very own paradise lost, for quite some time now: Kevin Andrews, in his classic book “The Flight of Ikaros” writes about his visit in the island in 1948. A decade later, upon finishing his “Breakfast at Tiffany’s” Truman Capote, along with best mate, Sir Cecil Beaton, spends the summer in Paros. “This is heaven on earth, a place of sun, sea and serenity”, he recounts. Indeed Paros is like no other; and it is this unique, uber cool personality, lifestyle and culture that nowadays continues to attract its lion share of visitors: Fun loving, swanky guys and gals in search of an authentic yet vivacious modus vivendi; food and drink enthusiasts; sporty, dynamic types looking for some action -from snorkeling and scuba diving to hiking and trekking or horse back riding; and that’s not to mention the windsurfers and kitesurfers from all over the planet who swear by the formidable Parian winds. Amidst the cold, bleak winter, we bet all this sounds rather enticing. With the first weeks of 2018 already over, it is probably high time to actually start honoring that New Year’s resolution. 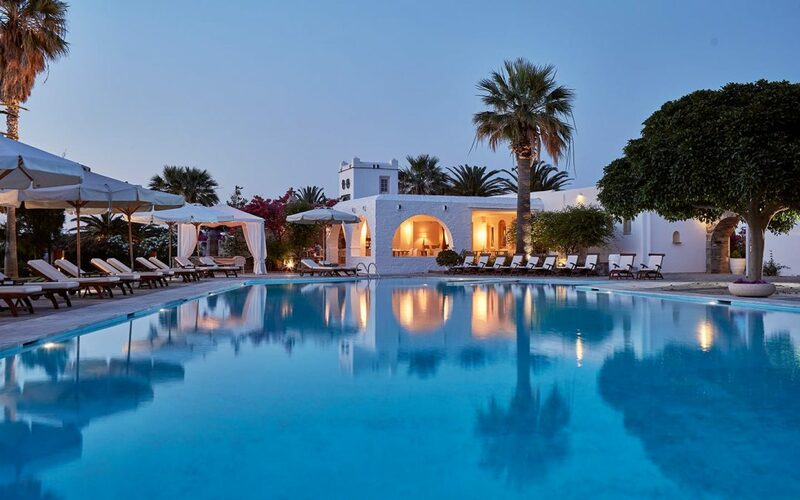 Located at the heart of the beautiful Parasporos bay, amongst an oasis of vineyards, trees and wildlife, Yria, is a most luxurious option for accomodation in Paros. Inspired by the postcard-pretty archetypal island settlements, this opulent boutique hotel and Spa, blends Cycladic chic with the latest amenities and a vast array of tailor made services. Whether you are a family vacationer, a Greek islands’ aficionado, a solitary, stylish traveller, or a member of a boisterous group of high spirited friends, you’ll find that this extraordinary accomodation in Paros, offers a wide variety of lodging types, to suit different party sizes, preferences and needs: Yet, from the superior, romantic double rooms, elegant junior suites, two storey family maisonettes, luxurious executive suites, and beautifully appointed suites with their own private infinity pool, to the spacious home away from home, residence suite, or the expansive, gorgeous Yria Ktima white stone, private pool Villa, Yria’s multiple options for accommodation in Paros, have one thing in common: They are designed with the discerning traveller in mind, to offer the utmost in indulgent living. After all this is what Yria and its affable people are all about: Making sure your every need, desire and whim is satisfied; while spoiling you rotten in the process! Just picture relaxing and unwinding in the open air spa amidst the resort’s luscious orchard; taking a dip in the exotic pool; or enjoying a drink at the Selini pool bar, followed by an exquisite Mediterranean meal at the sea view Nefeli restaurant. This is what paradise on earth looks and feels like! This year, be true to yourself and start planning your escape at Yria luxury accommodation in Paros today!